The only time I ever get knots is when my hair hasn't been conditioned properly, so this might be the problem, you're not conditioning in that area well enough? I'm sorry ??? I'm not quite sure, I've never heard of those knots! Are they in the back of your head? No, I condition the heck outta my hair. Yes, they are at the neck in the back of my head, right up close to the hairline. I get them too...they almost bring you to tears trying to get them out . When I do get them I use olive oil or conditioner to get them out. I use really liberal amounts so it works like a lubricant so I can work the knots out a little at a time with minimal damage to my hair and minimal tears for me....Hope this will help. You're right, they hurt a *lot* trying to get them out. My recommendation: Johnson & Johnson's kid's spray-in detangler. The generic versions are almost as good, and considerably less expensive. This is usually found near the baby shampoo. With curly hair, anything to get knots out is a plus. As a little kid, my grandmother always used Avon's one-step on my hair - which I'm not sure they even carry any more. But the J&J stuff is easier and less messy. Thanks for the tip though I'll try anything to help get those knots out..this time of year with scarves and turtle necks the problem gets worse! I have the same problem, except usually when I wear a top with a collar or if I sleep with it down. Now I make it a point to wear it up when I have to wear a collar and make sure I braid it before going to bed. 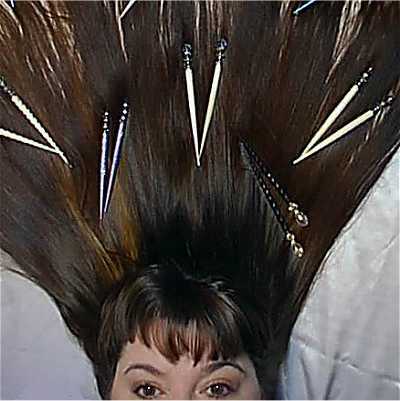 to get them out, i just patiently work at them with a large tooth comb, from the bottom up. Gradually, they work themselves out! Good luck!! Yes, you can use the spray-in stuff on dry hair. I don't have kids either, but originally bought it during a period when my allergies were out of control. Even washing my hair in the sink and rinsing 4 times, as soon as my damp hair touched my skin, I broke out. So I went looking for hypoallergenic shampoo & conditioner. Baby shampoo was the only thing I found - and they didn't make baby conditioner at the time but did make the detangler. I don't get painful knots at the back of my neck, but the hair at the back of my neck does still tend to mat, which is the only part of my head where the hair still does that. There's also lots of breakage and splits. I also have observed that I have some weird wavy/curly action going on there, and had been assuming that this was a result of some sort of mixed hair type at the back of my neck. I clipped out the wavy pieces, and trimmed the curlies back, too. It was hard to bring myself to do this, as the hair at the back of my neck is so much shorter than the rest of my hair. Hopefully, this will work out for the best, and I'll start to see some growth, though some of the wavies are so close to the scalp that I can't get them in front of my face to see and clip them. This explains something else, too. I have been noticing that locks that thin to nothing are only around the hairline, and there is also some damage on the surface, which appears as frizzies on the surface of my hair. But my hair is straight, why should a frizzy curl up? Because it was stretched out and broken in detangling, is why. So theoretically, trimming the last half or full inch of a frizzy hair that shows atypical curling should allow it to grow out and stop curling up. I need a hair minion to do these things for me. Mmmm, hair minion... Wonder if the cat can be trained to hold scissors? I had that problem a lot when I wore collared shirts. Seems to have gone away since I wear lower necks and don't tie my bandanas too tightly, though it seems to crop up now and again with low braids worn without a scunchie. I wanted to bump this up because I never had a problem with these knots....until now. What causes these things! Youch! I wish I knew the answer to that, Panpeus, because I get them too. I get the tiny knots at the nape, where my hair is a bit curlier. The hair rubs on collars, etc and manages to tie itself into knots. I get knots like this all down the length of my hair if I wear velvet and leave my hair down. i used to get knots too, but the hairdresser told me it was because i used Sun -In. ( note to self , Sun In, damages hair and causes knots.) i had to get them cut out . Ok, I have a question about little knots. I don't think they are the same as the ones you guys were talking about but they are still annoying. The are tiny little knots, like in one individual strand. What causes them? I never try to get them out because it would be impossible so I just snip them. Does anyone have a cure for them? I get those knots too and they always amaze me because I have no idea what causes them. I always just snip them off with scissors or even finger nail clippers if they're close by. I was able to get a knot out once by using super pointy tweezers but it took forever, not to mention a ton of patience. 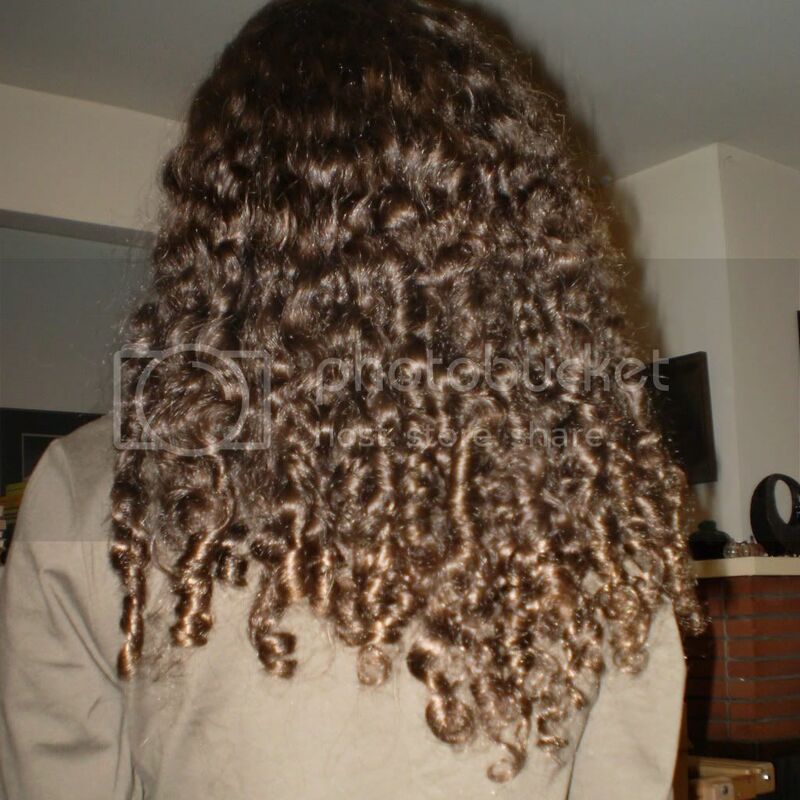 Curly hair is prone to these little knots and breakage when the hairs rub against each other. Keeping hair well moisturized helps the cuticle lay flat which decreases the knots and damage. Ooh, the mystery is finally solved! Thanks for the info. Sakina! I can vouch for the Johnson & Johnson kids detangler. When I had long hair before my mom used to use about half a bottle of it a day to help get snarls out-- It really works. My dad thought that they should've used me in the ads for that stuff!